As I mentioned a few days ago, I am putting together some posts about the initiation mechanisms for submarine sediment gravity flows (e.g., turbidity currents). The first post for that topic should be done soon. Today’s Sea-Floor Sunday images are from an active submarine sedimentary system in the Mediterranean Sea that has been characterized in great detail, mostly by French researchers. The forthcoming posts on initiation mechanisms will draw upon information from that work. The Var River of southeastern France empties into the Mediterranean near the city of Nice. There is essentially no continental shelf at this location and the river mouth empties directly into the Var submarine canyon. This is an important system to study because the current sea-level highstand we are in today has resulted in many (but not all) river mouths far from the shelf edge. During the Last Glacial Maximum (~18,000-25,000 yrs ago), sea level was ~130 meters lower and many more river systems were positioned at the shelf edge. Thus the Var system is one example of how a “lowstand” system might behave. 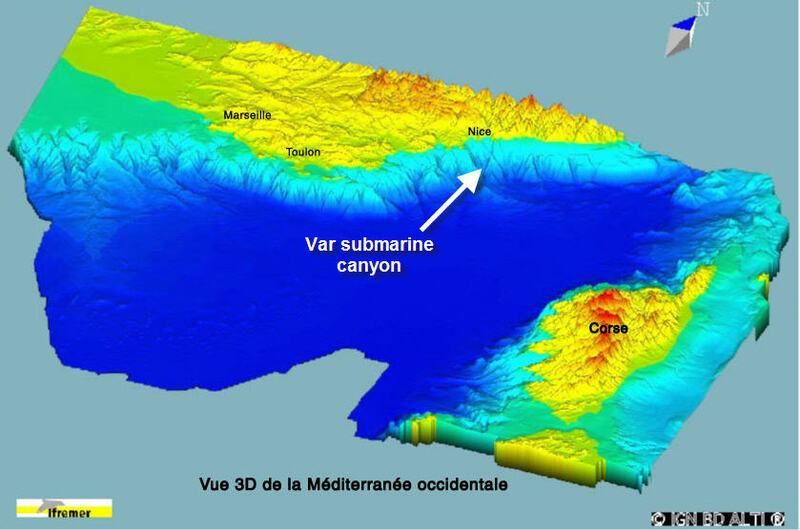 The first image below (from the IFREMER marine geoscience website) is a perspective view of southeastern France, Corsica, and the sea floor in between. 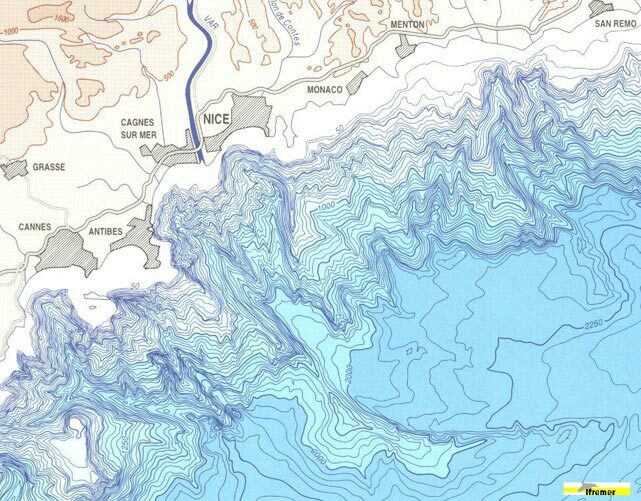 The next image (below) zooms in a bit and shows the bathymetric contours of the Var canyon and surrounding area. The Var River is the dark blue line just to the left of the label ‘NICE’. Note the submarine ridge that curves off to the east at the base of the slope. This is a depositional feature called the Var Sedimentary Ridge that is essentially a levee being formed as turbidity currents come down the canyon-channel system. 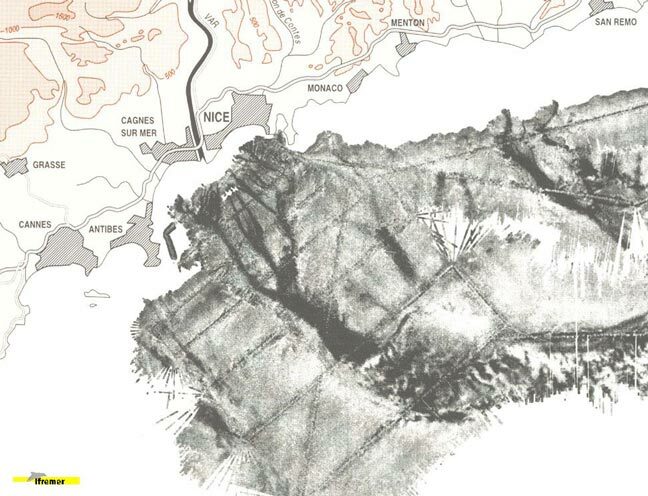 The next image (below) is the same map but now showing the ‘backscatter’ information from the sonar. These data represent the acoustic properties of the sea floor and, in this case, nicely reveal the tributary canyons coalescing into the main Var fan valley. Mulder et al. (1998), The Var submarine sedimentary system: understanding Holocene sediment delivery processes and their importance to the geological record: GSL Spec. Pub. #129, p. 145-166.